If you saw the site before, you can tell that I stripped off most of the advertising, I’m posting more often and doing all the stuff I tell all new bloggers to try. I dig it. The lolcats meme is long dead, ‘grats for realising the natural progression to faildogs. I’ll be passing this link on to my friends. Hopefully some of these are good sources. Wow. This is utterly ridiculous. I can only describe this website in one word. FAIL. I don’t get it. Lolcats is funny because it’s stupid pictures with even stupider captions. FailDogs is just the same joke, over and over and over and over…it’s boring. And by the way, is there some kind of ironic reason you posted this right after the “Raider or Creator” entry? I know you’re smarter than everyone who reads your blog, so go ahead and trash me and tell me how wrong I am. Your replies in the comments section to people who disagree with you are about as varied and interesting as that lousy FailDog site. Look dude, what do I care if you get it or not? It appeals to a certain demographic, maybe you’re not it. Regardless, Fail Dogs is huge. Man, Fail Dogs isn’t huge. You aren’t pioneering some original idea and spreading it to the masses. You are taking a dumb idea and making it dumber, if that is even possible. It looks as if you just took still shots from America’s Funniest Videos and added the word FAIL to it. How is that huge? I must not be aware of this vast demographic, because in all honesty I don’t see how this material can sustain a following. It just doesn’t seem to have that great of a hook considering other similar sites. I consider myself a decent judge of good content and I don’t know about this site’s ability to draw people back. In all honesty, I’m not jealous here. I really do wish you the best of luck any in venture you take. I might be wrong and I’m positive you know more about the internet community than me, but I’m not sure that even with the best blogging techniques you can promote a site that lacks a certain “newness”. You haven’t heard of dog owners? I don’t believe that being a dog owner is going to be the factor on what hooks people to your site. It wasn’t the hook for the “lolcats meme” site. The hook was in the original way the pictures were presented. Changing species without changing the style of presentation (hook) isn’t going to work, even if the owner of the species is larger. The content isn’t original enough to sustain a following. That was more my point last post, not an inquiry into who the demographic could be. I guess this has potential as a niche site for dog owners who use the internet. I’m sorry, I’m just not getting it though. I understand your concerns, and of course I considered them before we pulled the trigger. The problem is that you’re empirically incorrect. FailDogs traffic is obscenely high. It is one of the most popular blogs on the entire Tumblr engine. It has about as many RSS readers as Tucker and has literally thousands of user submissions. What are basing your assertion on? Have you looked at any data whatsoever? Do you even have the slightest inkling as to what the play is? My guess is that you can’t answer those questions to any sort of standard. This is really important because I react emotionally grab opinions on stuff all the time. But then, I stop myself, look at the data and reevaluate. If you can’t do that, it’s better not to commit to anything at all. The whole Fail ‘brand’ appeals to people who like a certain edginess and Schadenfreude in their humor. Take a long look at this video compilation of the funniest things that the Fail ‘brand’ has to offer. It’s all delight in the misfortune of others. That is where the humor comes from. You’re trying to market a crass, edgy type of humor to a demographic that is, in the America’s Funniest Home Videos-loving, dog-loving sense, almost never associated with it. Of course, the ironic thing here is that you are sacrificing your precious, muddled (preciously muddled, perhaps) “classical morals” in the interest of a saleability that simply, pretty clearly, just is not there. Look, fat people will always need pies, and that’s fine. But when piemakers wax philosophical and revolutionary, there are few things more grating. What do you get when someone is just smart enough to anatomize something, but dumb enough to hilariously fail at it? 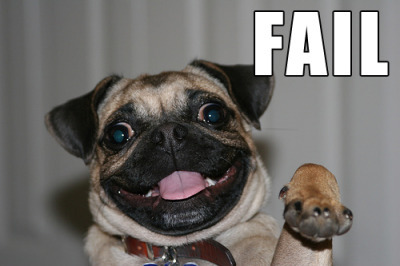 And speaking of hilariously failing, I’m not sure which is better: faildogs.com, or the fact that a website about funny dog pictures could so inflame someone with wrath. It wasn’t really emotional, but I guess I don’t know what will be popular. Good luck. faildogs.com just does not appeal to the type of person who reads ryan’s blog; that doesn’t mean no one likes it. I hate American Idol with a passion because I think the content is dumb and supremely average, that doesn’t mean the show is lame. If fact people love it. Its like the long tail says, find a niche market and cater specifically to them. What did your ban from the messageboard this morning teach you? Apparently nothing. I cannot believe anyone actually took this post seriously. So did you pay that guy the 6500 asking price? I know the site creator had it for sale on Ebay? Did you buy it? No, although it’s still a decent property at that price, it went for something different. Wow, you actually paid for that? I wish I had money to throw away. Oh well, I wish you and your FailDogs much success. What’s the central theme of most of my posts? That people – and that I – should always try to work on projects that are important to them. If you’d stopped to think about it for a second you’d realize that I am obsessed with dogs. Look at my delicious account. Perhaps, and I’m guessing here, I personally love this site and that is why I picked it up. And on top of that, this whole argument is ridiculous. Fail Dogs is objectively an enormously popular site. It will do well over a million pageviews this month because, like me, people LOVE IT. Great job picking up the site, Ryan. Fail Dogs is awesome. Your last post ought to put all of this into perspective for these people, that it’s a personal endeavor. I can’t wait to see how you build on this site. What I don’t understand is how you can not put a question mark on your last sentence. That is a sentence, right? Just kidding. You obviously take yourself too seriously, for I see your reply riddled with frustration and that you see your point of view as “the lighter side of life” and my objective criticism as “the dark side”. What is the point of having a comment section if you can’t handle objective criticism? At least mine was positive criticism, for I wished you success with FailDogs. Hey, I am obsessed with dogs too and also own a Dachshund. Although, I am not going to buy a website to prove my obsession. I guess I am just confused because I don’t see how this website is funny. We both must have a different sense of humor. It just seems like a spin-off of lolcats, which wasn’t funny either. The pictures are kind of funny, except for the caption which makes it not funny. But hey, its your hobby. Have fun with it; and I hope you earn a return on your investment. I think we can all reasonably agree that it’s more likely that I bought it because as a dog owner I understand the business opportunity as opposed to buying it to prove that I like dogs. On what planet does your comment make any logical sense? And it’s not like I made this thing myself over the weekend – it’s not a spin off, it’s a sustaining and highly trafficked website. It’s like weighing in on the 3rd season of Frasier and saying it’s just a sequel to Cheers and that those types of shows never work. If you look at the Alexa rankings, there’s this huge initial jump and then a slow, steady decline (and what looks to be an uptick in the last week or so). Why did that decline take so long? The actual rank is higher than it has ever been. Congrats for picking up a successful site. However, that doesn’t change the fact that I think your new website is enormously stupid. I LOVE lolcats, and I have seen quite a few funny pictures involving dogs. That aside, the majority (over 90%) of your pictures are not even remotely funny. Not in the least. So many haters. Take it for what it is. Dogs doing something funny, or just looking stupid. If you don’t get atleast a chuckle from this site, I feel sorry for you. The really awesome part about these comments is that down to the last man, they all applied to be my intern and they were all rejected 1) Because they sent rambling, incoherent emails 2) Had huge entitlement problems 3) No idea what they were talking about. I’d have disabled the comments section at this point. I don’t know how you do it. I know, Daniel! How does he handle having people respond to his writing in occasionally less than intelligent ways on the *internet*? I honestly don’t understand paid bloggers who have an aversion to commenters. Implying that the readers who frequent your site aren’t intelligent enough to reply to it seems pretty smug to me. Ryan: You seem to have a healthy respect for innovation, especially as it relates to using the internet to deliver content. This site’s greatest downside is its utter lack of innovation. It’s a difficult thing to reconcile, especially since many of your readers hold you in some sort of esteem.